FROM THE PUBLISHER:According to author Deborah Barnes, Makin' Biscuits - Weird Cat Habits and the Even Weirder Habits of the Humans Who Love Them, came to be when she got out of the shower one morning and wrapped her wet hair with a towel. She felt something land on top of her head - it was her otherwise shy cat, Mia, who decided that was the perfect spot to nap. Barnes was accustomed to her cats doing odd things (she has seven of them), but says, "this was odd, even for her standards," so she decided to pursue the concept of a book. I couldn't be happier that she did! Makin' Biscuits by Deborah Barnes is a MUST have for the library of EVERY cat lover. . I had the honor of reviewing both of Deb's books prior to "Makin Biscuits...", each one is special in their own way. You know the saying "the third one is the charm? ".......well, it is! "In today's world where the popularity of cats has soared, there are still shelters overflowing with cats in need of a home. Many wound up there for behavioral problems that could have been solved by understanding the instinctual mindset of a cat. 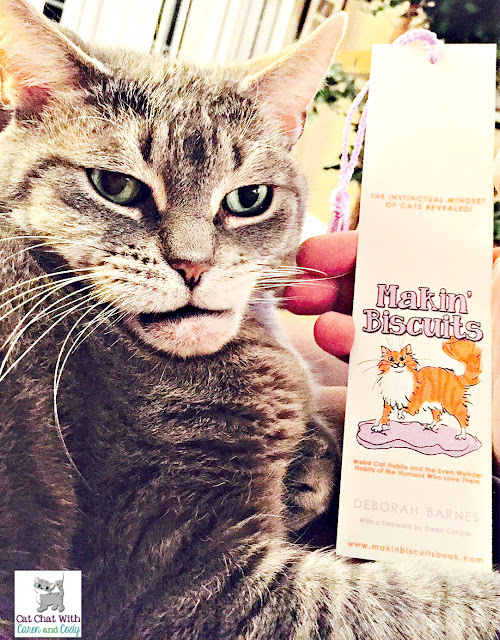 In Makin' Biscuits, Deborah Barnes tackles this subject in an enjoyable, easy to read manner as she shares a compilation of funny, sweet, and poignant stories from ailurophiles around the globe. FOUR PAWS UP!" ----Caren Gittleman publisher of Cat Chat With Caren and Cody. 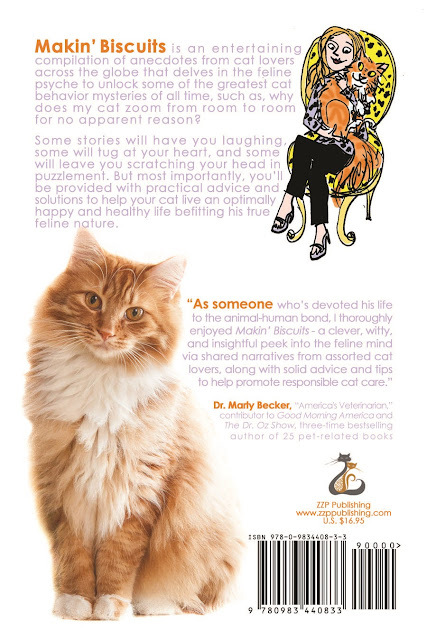 FROM THE PUBLISHER: Each chapter begins by Barnes narrating a story about her own cats, moves on to "Mews From Others" where she shares anecdotes from other cat lovers, and ends with a "Purr Points to Ponder" a section of information, advice, and tips to help cat guardians provide their cats with an optimally enriched environment befitting their instinctual nature. I enjoyed the "Mews From Others" immensely! Reading stories and moments shared by others about the unique qualities, "talents", and quirks their cats possess might just make you think that your cat(s), aren't that different after all! I have had cats in my life for well over 20 years, and the "Purr Points to Ponder" sections following each chapter (along with Deb's personal stories that begin each chapter), are some of my favorite parts of this wonderful book. Just when you think you have learned and read everything there is to know about cats...you find out that you HAVE NOT! Cat lovers! I think that is pretty self-explanatory! This chapter explores the often strange things that cats adopt as toys. 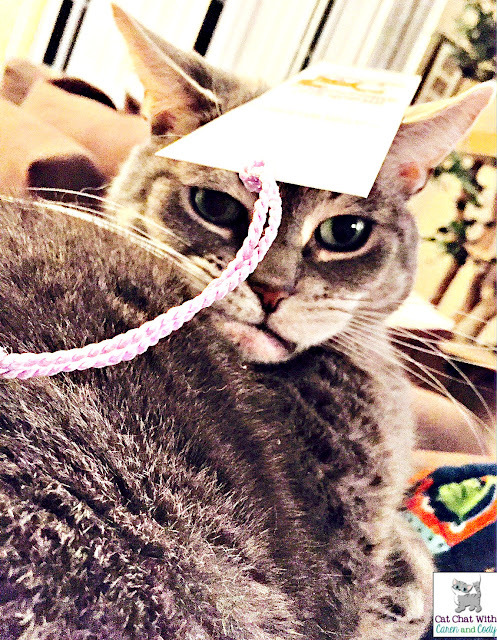 I particularly loved the snippet that Deb shared about Jazmine's affinity for running off with the stems of string beans as Deb is cooking, as well as the untraditional "cat toy" that Pattie Kleinke the human behind the blog, Stunning Keisha, bought for CK. A rocket launcher that shoots foam rockets that CK loves!!! makes a darned good cat toy too!!" If you want a certain seat it's a pretty good guess your cat will be there! In the Purr Points to Ponder section where Deb offers suggestions, advice and tips in each chapter she offers a suggestion for those who do not like cat hair on their couches and chairs. Just use various colorful throw blankets, and wash as needed! Had me cracking up laughing thinking of my own night time ritual with Cody where EVERY NIGHT he sits ON THE TABLE (that he is NOT allowed to be on, in a quest for more food). If I don't share fast enough, or choose not to share at all, he will reach his paw out and tap me, like "Hey lady, you forgot something!" This chapter will have you rolling with laughter. We all know our cats have the universal talent of ALWAYS knowing when it is time to eat. 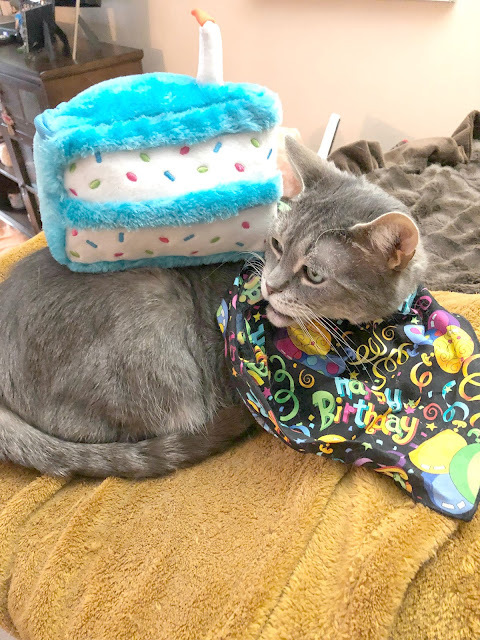 They know based on our daily rituals and their own internal "clocks" An excerpt provided by Dawn White, Lola The Rescued Cat is one of many purrfect examples of the "even weirder habits" of the humans who love these wonderful beings. Talk about devotion! "My cat, Lola, expects breakfast every morning, but she insists it never be in the same spot each day! I frequently find myself following her around my apartment, with food bowl in hand, which I put down when she decides on the perfect breakfast spot." You will have to purchase the book to find out what that chapter is about! Cody and I are just tickled to have our submission be a part of that chapter! just look at the "WEIRD" that I had to endure!!" 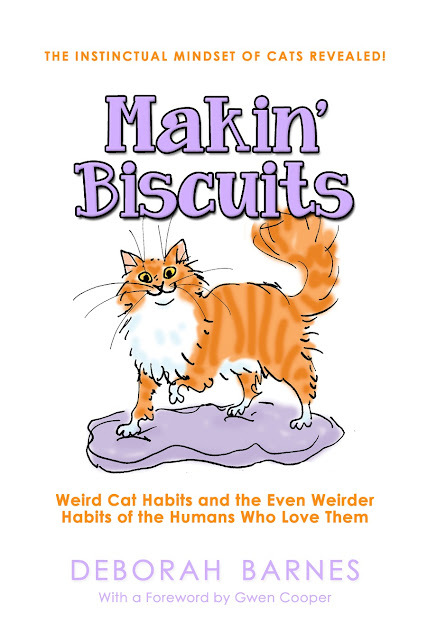 FROM THE PUBLISHER:Deb hopes Makin' Biscuits will make a difference in cat welfare by helping to enhance the feline-human bond and to enlighten readers on certain subjects, such as the need for spay/neuter to help reduce the staggering numbers of cats in shelters (in the United States alone, the American Society for the Prevention of Cruelty to Animals indicates each year approximately 3.4 million cats enter shelters nationwide); as well as to provide readers with resources, tips, and advice to correct common behavioral problems that can land a cat into a shelter, such as litter box issues. Adopting a pet is supposed to be a lifelong commitment. Your cat is depending on you to take care of him, and if you don't give him the proper tools to be the instinctual creature he was born to be, you're not being fair to him. Or you....while cats might appear to be complex, they truly are simple. Their actions and behaviors are their way of communicating with you. Help others who may not understand cats as well as most of you who are reading this, by "gifting" this book for the holidays or for any day that someone is adopting or thinking of adopting a cat. For ordering information, please visit http://www.makinbiscuitsbook.com. Deborah Barnes is the owner of ZZP Publishing, LLC and the author of Makin' Biscuits - Weird Cat Habits and the Even Weirder Habits of the Humans Who Love Them; Purr Prints of the Heart - A Cat's Tale of Life, Death, and Beyond; and The Chronicles of Zee & Zoey - A Journey of the Extraordinarily Ordinary; as well as the award winning cat-related blog, Zee & Zoey's Cat Chronicles. 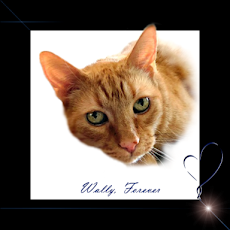 She is the Vice President of the Cat Writers' Association and was awarded 2013 "Writer of the Year" by Friskies Purina. She is the Secretary of the nonprofit, Pawsitively Humane, Inc. of Miami, Florida and her freelance work has been featured in Cat Fancy magazine, Kittens 101, Catster.com, BlogPaws.com, TheCatSite.com, and the American Association of Human-Animal Bond Veterinarians newsletter. Give them A LIKE on FACEBOOK!! In full disclosure:I was not compensated for this review. I was sent a complimentary copy of "Makin' Biscuits" in exchange for my always honest opinion. We are in that book too...and three places if we recall. We got a copy for ourselves too. Can't wait to read it! Yes! You got that right! You are in the chapters "Love Hurts," "If You Scoop It, They Will Come," and "Paper or Plastic?" Sorry Cody...I didn't mean to reveal all those secrets about you, but I'm sure there's still a mysterious thing or two about you that I left out! Tell your Mom I loved her review and that I really appreciated her sharing the story about you and Bobo in the chapter, "The Twilight Zone." 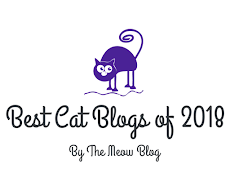 And she really hit the nail on the head - most of us cat lovers in the cat blogosphere know what makes a cat tick and we do our best to provide our feline friends with the proper environment and tools to keep them happy and healthy. 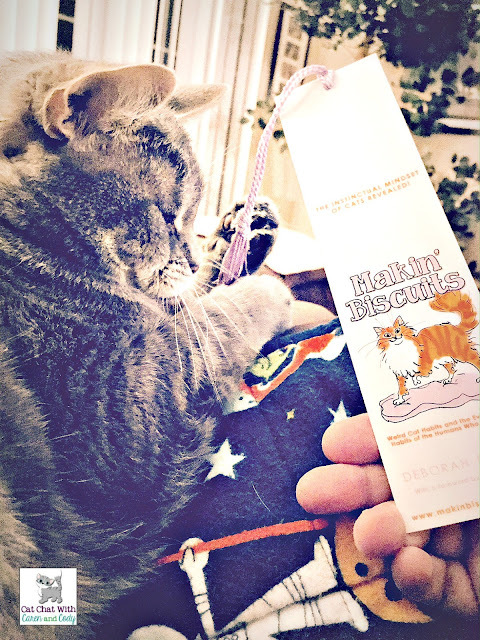 But a lot of cat guardians outside of our blogging world don't know some of this stuff, and that's why I wrote Makin' Biscuits - I want the world to be a better place for cats! 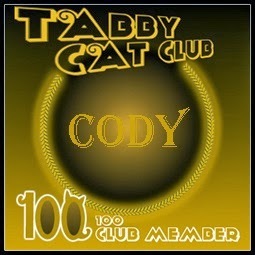 So thanks for being a good sport about it and thank you for helping cat welfare! 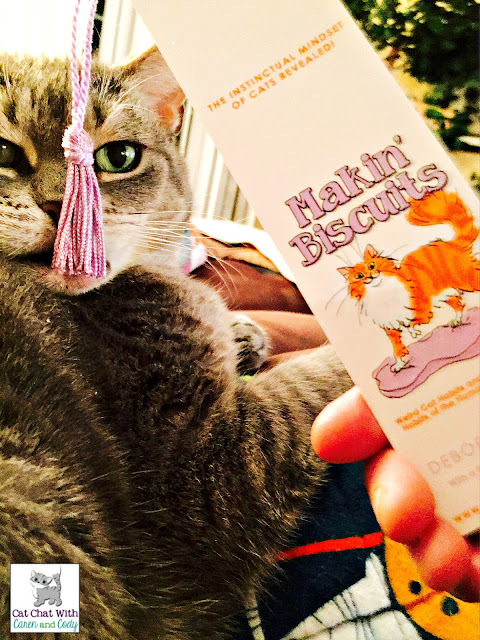 Purrs from Deb of Makin' Biscuits! Congratulations to Deb. Sounds like she has another hit on her hands. Cats are such unique and wonderful creatures. MOL - it's funny you say that, Chuck! I actually do mention in the book that I had to stop writing, only because the story was becoming the next War and Peace! laughing at BOTH of you! Chuck, it's 261 pages (trust me you would LOVE IT!!) Deb, that is the EXACT reason I left out my submission in "The Twilight Zone" chapter, this review was turning into "the next War and Peace" because when I was noting chapters that I loved when I was reading, I hit nearly EVERY SINGLE ONE lol! I didn't even hit the tip of the iceberg in my review! MOL...now this comment thread is turning into the next War and Peace! I love it! And thank you on having so many favorite chapters - they were so much fun to write and I'm sure that cat lovers reading the book will be able to relate on so many different levels! We ordered a copy of the book and can't wait to get it! You've got a couple stories in the book - in the chapters "Paper or Plastic?" and "A Hair-Raising Experience." How cool. Sounds like a great read. I linked this post to Awww Mondays. So much awww in this post. Sandee - Thank you so much for posting this review to your Awww Mondays - I really appreciate it! You know that this book is on my 'must have' list! We got our copy on Saturday!!! We can't wait to get started ... and it will mean even more to read stories about the cats we've come to know and love (like Cody :) ... poor boy's secrets revealed). I can't wait for you to read it Momma Kat and Her Bear Cat. And I love the stories you submitted that are featured in the chapters "You Can Pet Me, Just Don't Touch Me," "Are You Going to Eat That? ", "Good Help Is So Hard to Find," "Paper or Plastic? ", and "Man's Best Friend." What a cool book !!!! Liked it !!!! And we want to thank you very much for your beautiful comments !!!!! Thank you !!!!! We were very happy to read them !!!! Caren, you out did yourself on this fab review. I didn't even get a review copy. Wishing you peace, love & purrs this week. I'm glad you enjoyed the review Layla! Caren always does such a great job! I actually didn't send out many review copies at all for this particular book as I know how busy everyone is this year with projects of their own, especially you with your upcoming book, and I didn't want to add stress to your schedule! Purrs of love! Oh dear...yes, better hide the book from Dakota!! And thanks for the story submissions da tabbies o trout towne! You're in the chapters "Houdini Cats" and "Watering Holes and Bathroom Breaks." It sounds like you had a blast reading this! What a fun way to share stories about how so many cats behave. We knew as soon as we saw it that it had to be great, after all Deb did it! Brian...if there is anyone nicer or sweeter than you, I've yet to meet them!! Thank you for your kind comment. Great review - and great pictures of Cody ! Sounds like a fun book with an important message. Great review. I have a Kindle version, I can't wait to read it. Thanks for being a part of the book 15andmeowing - you have some great stories in the chapters "Houdini Cats" and "Rules of the House." OMC! You outted TW! MOL! I"m in the book but we can't afford a copy right now. I do love my rockets though. TW knew I would cos like you said she knows what makes me tick. Excellent review. CK - I sure do know what it's like not to be able to afford things. But I want you to be able to enjoy the book - we'll have to come up with a solution for you! Hehehe!! I sure did! I thought it was such a clever and unique idea! LOVED it!!!! Thanks for your kind words too! Great review, Caren and Cody! We got our copy of Makin' Biscuits just last week, and it's AWESOME! We're really enjoying all of the stories, especially the ones submitted by friends like you. Bravo to Deb on this wonderful book! Aww!! Thank you meowmeowmans! Your story about your angel Moosey in the chapter "Are You Going to Eat That?" is so adorable! It sounds like a fabulous book, Caren! I'd seen on FB that it was done. 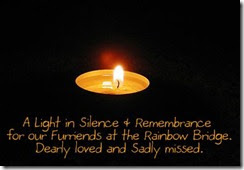 Thanks for the post -- it's a good reminder to me to look for it! Good luck at the dentist. I go every three months for a cleaning, so it's easier. Not fun, but easier! Great review! It sounds like a great book with lots of stories from our friends! That does sound like a great book. Too bad people think that cats making biscuits is weird. Great review too. Great review! We have our copy and we're looking forward to reading it. Thank you for being a part of the book, Three Chatty Cats!! Your story in the chapter "Crazy Cat Lady" is one of my absolute favorites! This is a wonderful review of what sounds like a wonderful read! Cats and their quirks are so charming, and I love that this book features that. And I love the title! I also appreciate the focus on ensuring that people understand cat behavior, since so many people out there don't understand it, and kitties suffer from that. Thank you for sharing this with us! What a wonderful review! We'll put that on our Mom's wish list, even if we have to scratch it into the woodwork! I agree with many of the above comments, your Mum makes real nice reviews. 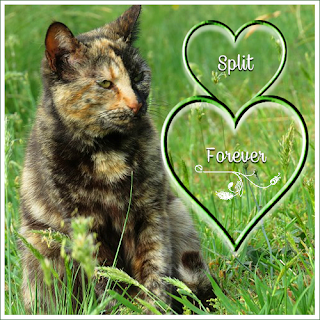 As we are members of several Facebook french cat's groups, we are oftet sad or unhappy to see how much people can be real stupid when it's come to cat's behaviours. They don't understand us. Some time it's funny, some others it's sad, so sad.